Our family is a long-time fan of the classic game Twister. After all, what’s not to love about getting family members up and active, having a ball together? Twister is guaranteed to end in laughs… at least most of the time – maybe not that one time when my hubby overbalanced and squashed our nine-year-old. Don’t worry, the story has been preserved between the pages of our shared family history book and she can laugh about it… now! We also like to use the Twister mat and spinner for other games too. 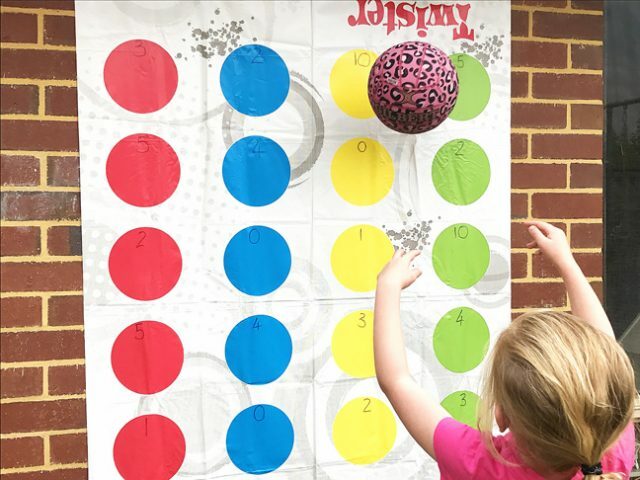 We invented a colouring in game because my five-year-old loves to colour, we’ve played more than a few games of sight word Twister, and most recently, in a rare moment of inspiration I hung our Twister mat up on the wall outside, added a netball and managed to create an active element in an (otherwise quite boring) homework session. 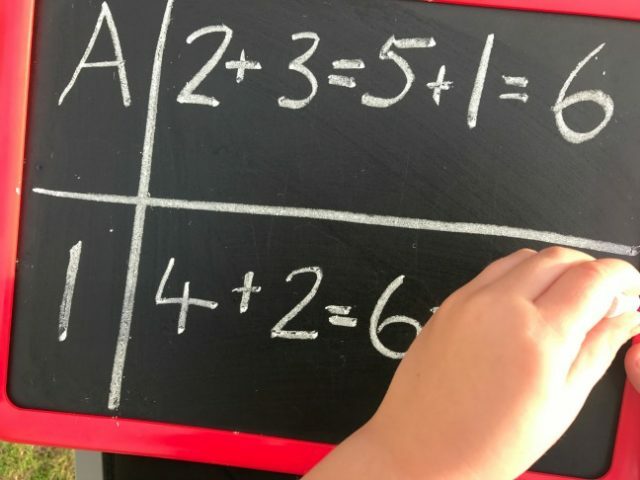 Learning math facts, such as multiplication tables, often involves lots of repetition that kids can, quite frankly, find rather boring. I am always on the lookout for ideas for upping the fun factor when it comes to homework and I find activities that get my girls moving are the best of all. Kids are active learners – learning more easily when a lesson involves a hands-on ‘doing,’ moving or exploring element, rather than just observing or listening. Hence, in our house, Twister Maths was born! 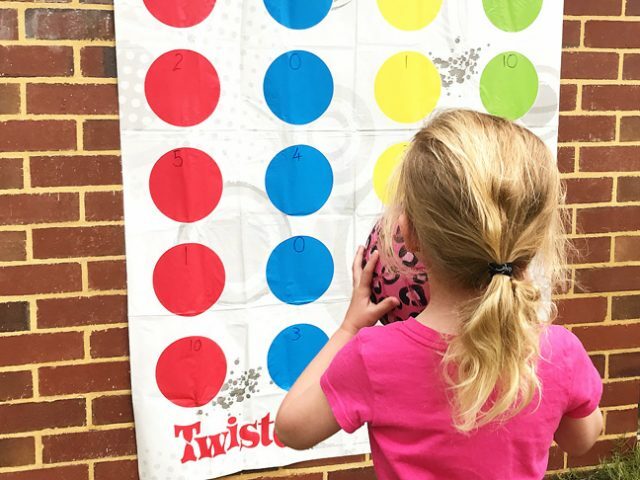 Press loops of tape onto the back of the Twister mat, place the mat against the wall and smooth over the tape loops with your hand. Use the whiteboard marker to label each of the coloured Twister circles with a number, randomly placed and repeated as necessary. The numbers you choose will correspond with the math facts you will be revising with the game (see below). Players take turns to throw the ball (or handball the football) at the mat and then answer a maths problem that corresponds with the circle the ball lands on. For example, for six times tables, if the ball lands on 12 then the child must answer the problem 12 x 6 = X. Simple addition: Mark the mat with numbers 0-9. Each player has 3 turns at throwing the ball. After each throw, the number scored is added to the previous total. For example, on the first throw for Player 1 the ball hits 2, on the second turn 3 and so the scorer adds 2 + 3 = 5. On the final throw, the ball lands on 1 and the scorer adds 5 + 1 = 6. The player’s total is six. Scores can be recorded on a paper or blackboard. The player with the highest total after each round is the winner. Make ten: Mark the mat with numbers 0-10. 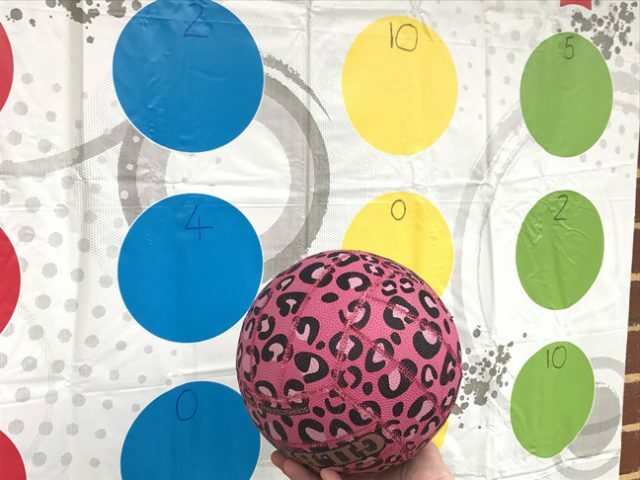 Each player takes a turn at throwing the ball and then identifying the number that needs to be added to the number the ball lands on for a total of ten. For example, the player throws a 2 and identifies that 8 is the missing number to make 10. Doubles facts: Mark the mat with numbers 0-10. Each player takes a turn at throwing the ball and then identifying the number that is double the number hit by the ball. For example, if the ball hits a 6, then the child must say what double six is. 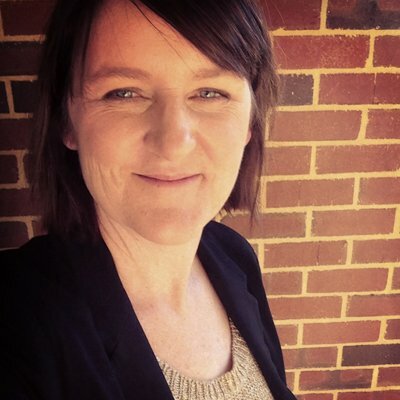 Number halves: Mark the mat with a range of even numbers. The player must identify the number that is half the number hit by the ball. For example, half of 12 is 6. Multiplication facts: Choose which times tables set will be revised and mark the circles with numbers 1 through 12. When the ball hits a circle, the child must provide the answer for the multiplication problem that corresponds with the number hit by the ball. Of course, when homework is this much fun, getting your kids to come in for dinner might just become the real challenge!